Here’s another Holy Week Lenten activity that gives catechists the opportunity to introduce children to the popular custom of palm weaving & braiding. Palms are sacramentals – “sacred signs instituted by the Church” (CCC 1667). They represent our homage and loyalty to Christ the King, who was hailed as king as he entered Jerusalem to the waving of palm branches. 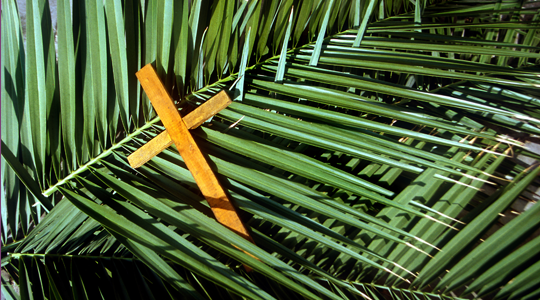 Catholics have long displayed palms in their homes after Palm Sunday as a sign that Christ is the King of our homes. One of the ways that Catholics of many cultures (especially Italian, Polish, and Philippino) have shown reverence for palms is by weaving and braiding them. On his Web site – Italiansrus.com – Anthony Parente shares his family’s customs of braiding and weaving palms. Not only does he provide background on the tradition of palm weaving, but then he also provides palm weaving tutorials for creating some wonderful designs such as braids, cones, crosses, crowns of thorns, and rose buds! Depending on the degree of difficulty (which Anthony indicates for each), you may be able to help your students complete some of these creations! Thanks, Anthony, for sharing this wonderful tradition! This is way cool. Thank you and Anthonly for sharing. We’ve belonged to two italian parishes and always wanted to know felow parishioners seemed to so easily transform their palms into crosses and intricate braids. I’ll be trying out the crown of thorns this weekend. Maura, that crown of thorns is awesome, isn’t it? perhaps it is too late this year, but I would like for you to know about us. For more than 30 years I have been involved with the palm used by the Church for Palm Sunday. Two years ago we began supplying Strip and Decorative Palm to Church Goods Dealers and to Churches directly. Many Churches prefer the whole, unprepared bud or “head” of the palm. Freight charges cause this to be costly but to our customers within 500 miles, we offer free delivery with a minimum order of 300 bundles of the Large or 50,000 of the Dwarf. We will provide the very freshest products. Hi Barb! Thanks for your thoughts about palm braiding and your own experience in this art. This is an art form that has always impressed (and eluded!) me! There is a man named Gene Fedeli who teaches the art of palm weaving and is one of the best. He has a web page on the subject. Thanks for the recommendation Tom!